My river-rat friends have a saying that “you can’t have too many straps”. But from time to time we should try to keep an eye on the condition of those straps. We use them for so many things, mostly for securing down things of value, and often take their integrity for granted. Here, I am still dumbfounded that the above photo even happened. A $20 strap failed/broke all on it’s own while I was walking over to my daughter’s school Monday afternoon to pick her up. It’s close enough for me to walk and I wanted to capture some fall color, bursting in my neighborhood this time of year. While crossing the street and approaching the curb, I suddenly saw my camera falling to the pavement. I managed to break some of the fall with my left foot but it still hit pretty hard, the lens just exploding. A feeling of nausea crept over me as I picked it up to survey the damage, wondering what the heck just happened. The lens, a 50mm f1.8 (my least expensive one-whew!) was toast, the electric contact ribbon severed in two. When I saw the three dents in the top of the camera, my heart sunk, as there goes my ebay resale value by a considerable amount. Then I saw the strap and the mystery was solved. As I sat with this and pondered the implications (the body works fine as far as I can tell) I could feel my reactions taking on typical Classical/Romantic approaches to my dillemma as described in the book “Zen & The Art of Motorcycle Maintenence”. According to the author, a Classic approach person looks at an object and sees the underlying form and what the thing can accomplish, while a Romantic looks at same thing and only sees the surface beauty. While the camera works fine (I think), it is my newest, most expensive camera and now it has several crappy, obvious dents in the top. The lens is history, but it was also my least expensive one to replace, two figures, not four. So, after wrestling with this occurence for a day or so, I’m left with the feeling that the accident could have been much, much worse. And I’ll be giving my straps an extra tug to check their strength from now on. 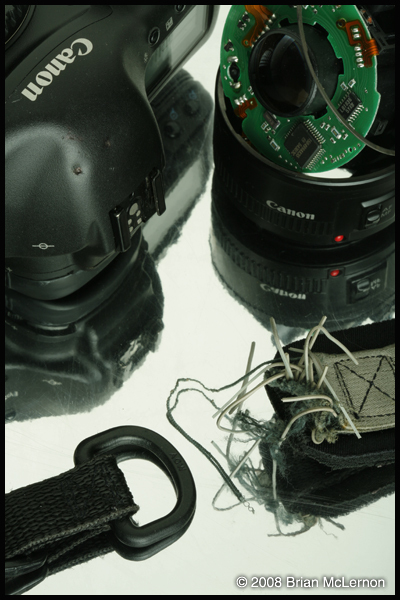 This entry was posted in Personal and tagged camera repair, lens exploding, strap failure on October 29, 2008 by admin.